Bottle, box, can, carton and jug—dairies put milk into these containers and many also package non-dairy beverages, most notably iced tea and lemonade. And while many dairies have shelf-stable fluid filling and packaging systems, the majority focus on fresh, refrigerated distribution. Refreshments sold through the chilled channel are gaining appeal among today’s health-conscious consumers. This is because these perishable products suggest minimal processing and naturalness, two attributes that the growing number of consumers focusing on what they put in their body find attractive. And with beverages such as iced tea sporting a healthful halo (see section at end of blog that discusses tea’s better-for-you benefits), it is no wonder why more and more dairies are growing their refreshment line. The future of the beverage industry is nutritious and functional drinks made from high-quality ingredients and pure water, marked by an undeniable accountability for the effects of processing, packaging and distribution. According to Supermarket Guru Phil Lempert, “2013 is going to be a very interesting year for beverages, especially healthy beverages. The beverage industry is going to heat up. We’ve seen a war against unhealthy, high-calorie, sugary beverages and over consumption, starting with New York’s size regulation and Coca Cola’s advertising about obesity factors. Now, consumers are going to want to understand what makes a beverage healthy, and they’re going to want a variety of healthy options at their supermarket. Without a doubt, beverage manufacturers of all kinds need to prepare for certain change, as we’re entering a realm that may not be comfortable for antiquated beverage businesses." Lempert will be the keynote speaker at Healthy Beverage Expo, which will be held June 7 to 9 at the Las Vegas Convention Center. The event is co-located with World Tea Expo. For more information on Healthy Beverage Expo visit HERE; for World Tea Expo, visit HERE. Dairies are well poised to deliver on health and taste. And if it’s made by a dairy, it has to be good! Turkey Hill has long been a leader in the refrigerated ready-to-drink tea category. The company uses the tagline “Cold Fashioned for Freshness.” Some of the dairy’s more recent flavor combinations include Cherry Pomegranate Black Tea, Diet Blackberry Sweet Tea and Light Wildberry Green Tea. 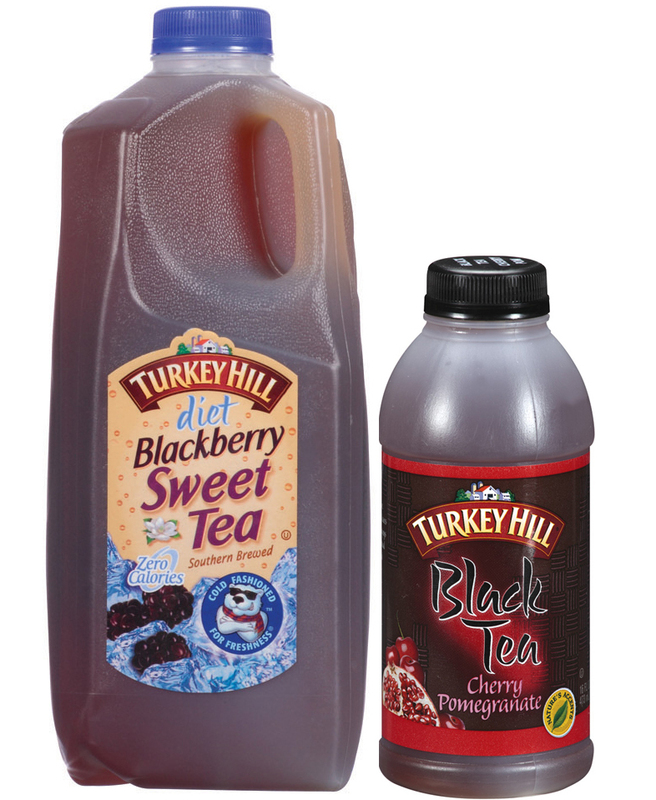 For more information on Turkey Hill’s iced teas, visit HERE. Less sugar and fewer calories is a growing trend in juice drinks. 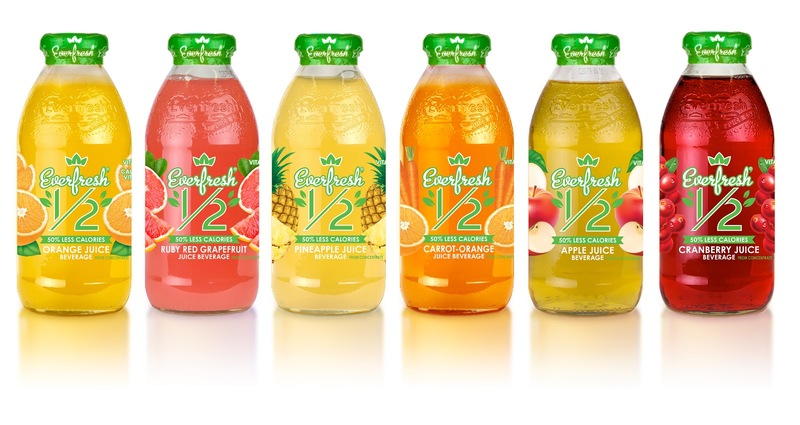 National Beverage Corp., recently introduced Everfresh ½. The juices, which come in six varieties--Apple, Carrot-Orange, Cranberry, Orange, Pineapple and Ruby Red Grapefruit—contain half the sugar and half the calories of their original 100% pure juice counterpart. The single-serve juices come in 16-ounce glass bottles. For more information on Everfresh ½, visit HERE. ITO EN now markets Teas’ Tea Plus half & HALF. This ready-to-drink tea beverage line is made from fresh-brewed green tea that is infused with fruits juices and other flavors. Varieties are: Coconut Water, Grape, Green Apple, Lemonade and Peach. Each 16.9-ounce square plastic bottle contains two servings, with each serving providing 50 calories. The drink is slightly sweetened with cane sugar and a touch of stevia. 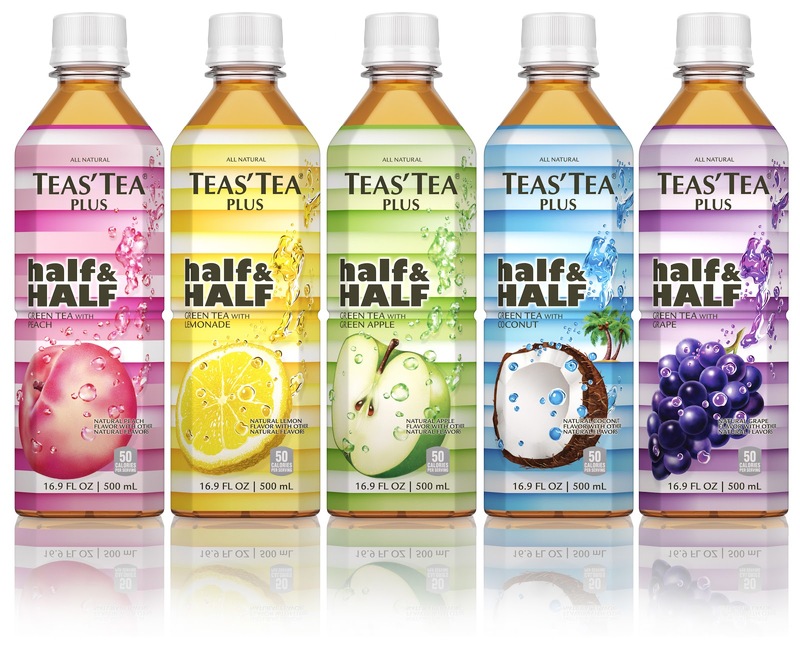 For more information on Teas’ Tea Plus half & HALF, visit HERE. 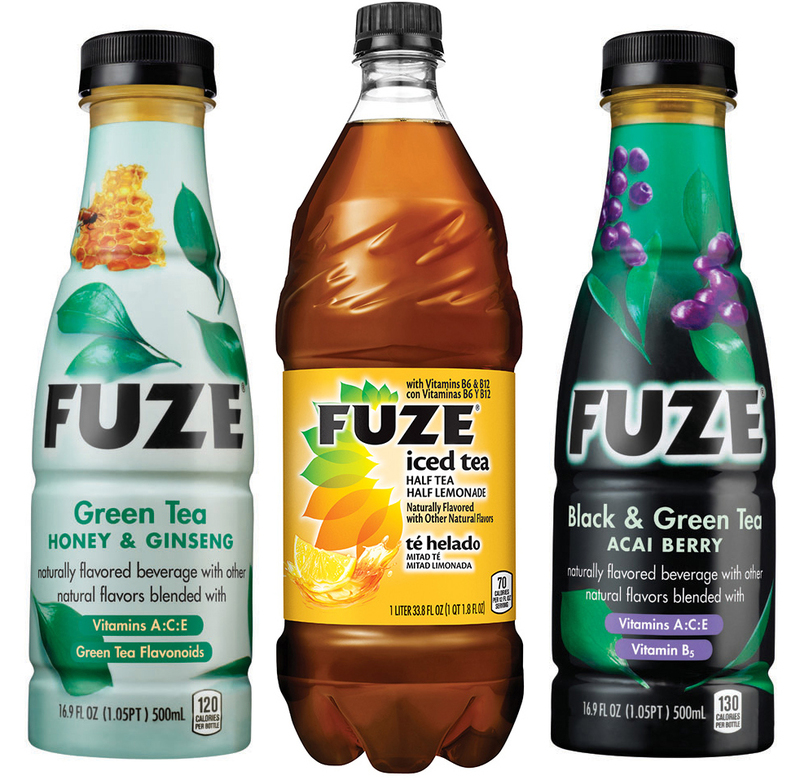 The FUZE brand of uniquely flavored non-carbonated beverages, which is now under the ownership of The Coca-Cola Co., recently entered the tea and juice drink category. Varieties are: Berry Punch, Half Tea Half Lemonade, Honey & Ginseng Green Tea, Lemon, Strawberry Lemonade, Strawberry Red Tea and Sweet Tea. 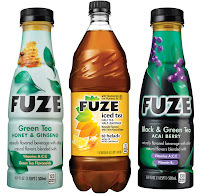 For more information on FUZE Tea, visit HERE. Another Coca-Cola brand—Honest Tea—is extending its reach in the kids’ beverage category with new Honest Splash. Designed for older kids, the new line of 70-calorie juice drinks will be sold exclusively at Target from mid-March until the end of June, when the drinks will roll out to other retailers. Each 12-ounce plastic bottle contains about 30% juice, its sole source of sweetness. Varieties are: Berry Good Lemonade, Goodness Grapeness and Super Fruit Punch. For more information on Honest Tea, visit HERE. In celebration of its 20th anniversary, AriZona Beverages has rolled out numerous new concepts, including the Golden Bear line. This lemonade concept pays tribute to legendary golfer Jack Nicklaus, whose nickname is Golden Bear. The line debuted in five varieties, Original with ginseng and honey (in regular and 10-calorie formulations), Mango, Mint and Strawberry. 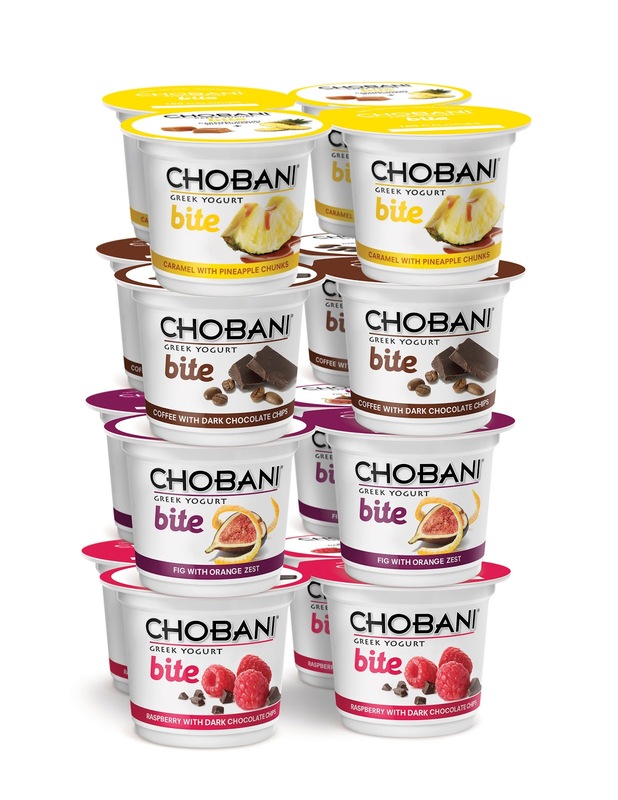 New flavors will roll out in 2013, with the first being Pink Lemonade. For more information on Arizona Golden Bear Lemonade, visit HERE. The company also added a strawberry flavor to its popular Arnold Palmer line of half lemonade and half iced tea. For more information on Arizona Arnold Palmer Strawberry, visit HERE. 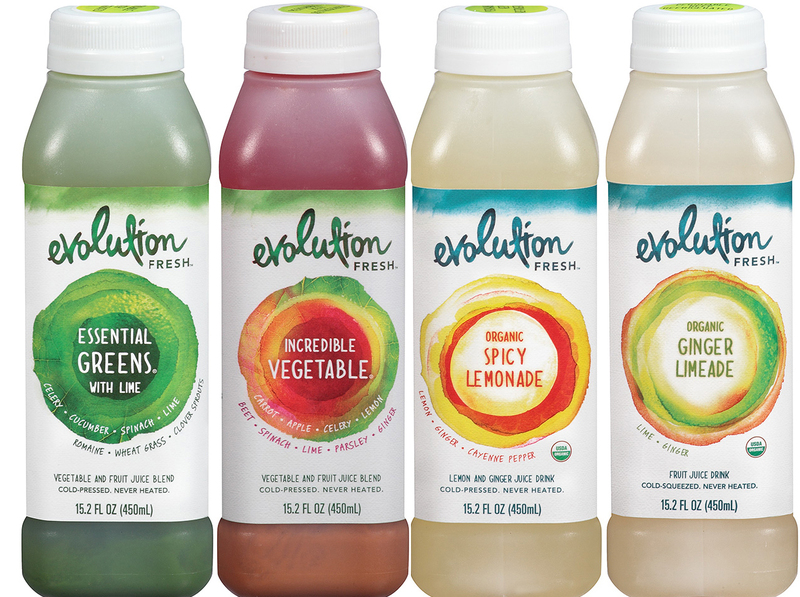 Evolution Fresh Inc., a company acquired by Starbucks in 2011, continues to be creative with its juice and beverage concepts. The company is one of the few major juice companies in the U.S. using high-pressure processing (HPP) to safely deliver more of the flavors, vitamins and nutrients of raw fruits and vegetables. 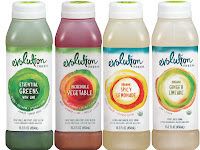 Evolution Fresh offers an extensive portfolio of bottled juices for sale through retail markets and select Starbucks stores. Sold at a premium, varieties can be simple, yet unique. 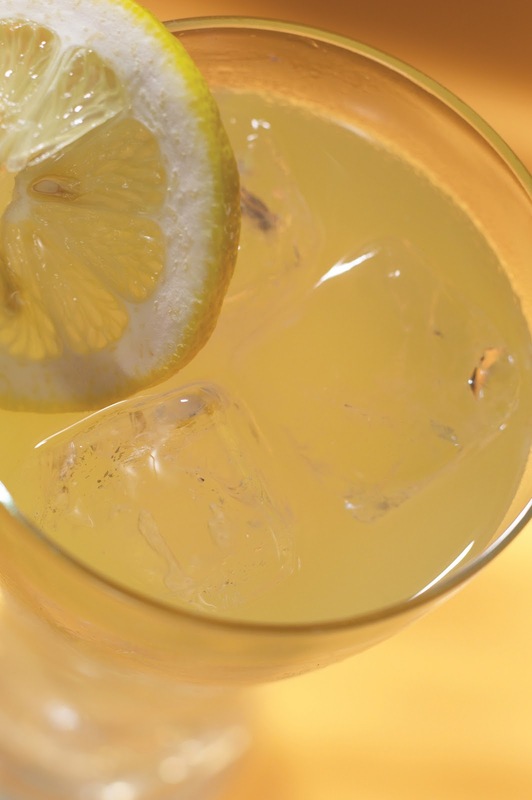 That’s what you get with Spicy Lemonade, which combines lemon, ginger and cayenne pepper. They can also be quite complex. Incredible Vegetables combines the juices from carrot, apple, celery, lemongrass, beets, spinach, lime, parsley and ginger, while Sweet Greens is a medley of celery, apple, cucumber, spinach, parsley, romaine, lemon, lime, wheatgrass and clover sprouts. For more information on Evolution Fresh, visit HERE. 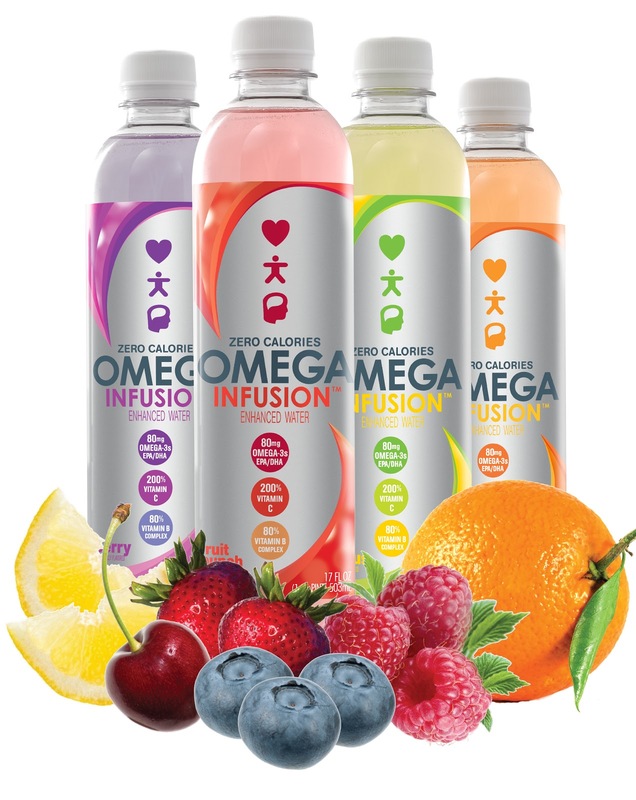 Oceans Omega LLC, recently debuted Omega Infusion, a clear, zero-calorie, omega-3 fatty acid-enhanced water beverage. One 12-fluid-ounce bottle of Omega Infusion water delivers 40 milligrams of both docosahexaenoic acid (DHA) and eicosapentaenoic acid (EPA), 200% of the Daily Value of vitamin C and 80% of the Daily Value of vitamins B3, B5, B6 and B12. Flavors are Berry, Citrus, Fruit Punch and Orange. For more information on Omega Infusion Water, visit HERE. 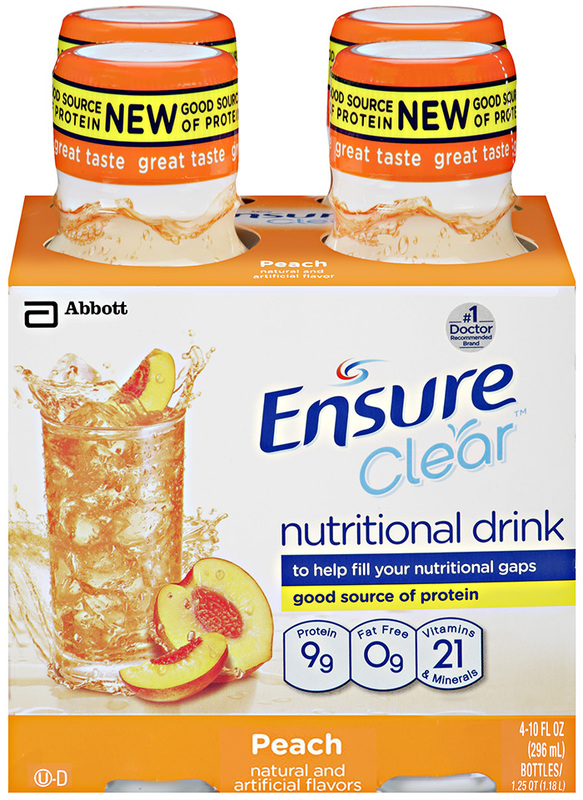 Abbott now offers Ensure Clear, a fruit-flavored nutrition beverage available in Peach and Blueberry Pomegranate flavors. Ensure Clear offers three times more protein (from whey protein isolate) than juice, along with 21 essential vitamins and minerals to help adults looking to fill dietary gaps. A first-of-its-kind in the nutritional supplement beverage category, this clear, fruit-flavored beverage was designed to attract new users to the category. For more information on Ensure Clear, visit HERE. For more information about ingredients used in the formulation of clear beverages, please link to this article I recently wrote on the topic for FOOD BUSINESS NEWS/BEVERAGE BUSINESS NEWS. With tea being the second most consumed beverage in the world, next to water, interest in its potential health benefits has grown exponentially; in just the past five years there have been more than 5,600 scientific studies on tea, forming a substantial body of research on this ubiquitous beverage. Many of these studies were discussed at the 5th International Scientific Symposium on Tea & Human Health, which was held in Washington, D.C., on Sept. 19, 2012. Among the findings is research suggesting that green tea and caffeine may trigger energy expenditure that may promote weight loss. Another study illustrates how tea may help counter the adverse effects of high-fat foods on blood vessels, which could possibly reduce the risk of atherosclerosis, the most common cause of death in the U.S. Numerous studies suggest tea supports heart health and healthy blood pressure, and appears to be associated with a reduced risk of cardiovascular disease, including stroke and heart attack. New research presented by Claudio Ferri, MD, University L’Aquila, Italy, found in 19 normotensive and 19 hypertensive individuals that black tea was able to reduce blood pressure. In the hypertensive patients, black tea appeared to counteract the negative effects of a high-fat meal on blood pressure and arterial blood flow. Hypertensive subjects were instructed to drink a cup of tea after a meal that contained .45 grams fat/lb. body weight. The results suggest that tea prevented the reduction in flow mediated dilation (FMD), the arterial ability to increase blood flow that occurs after a high-fat meal. In a previous study conducted by Ferri, tea improved FMD from 7.8% to 10.3%, and reduced both systolic and diastolic blood pressure by -2.6 and -2.2 mmHg, respectively, in study participants. “Our studies build on previous work to clearly show that drinking as little as one cup of tea per day supports healthy arterial function and blood pressure. These results suggest that on a population scale, drinking tea could help reduce significantly the incidence of stroke, heart attack and other cardiovascular diseases,” concluded Dr. Ferri. Obesity is the largest public health concern in the United States and there are few strategies that provide long-term success. New research on tea catechins suggests that they may provide a benefit in maintaining body weight or promoting weight loss. In a comprehensive review of the published data on this topic, researchers from Maastricht University, Maastricht, The Netherlands, found that 24-hour energy expenditure and fat oxidation increased when subjects consumed green tea and caffeine. The results of a meta-analysis suggest that the increase in caloric expenditure is equal to about 100 calories over a 24-hour period, or 0.13 calories per milligrams of catechins. In addition, green tea and caffeine also appear to boost fat oxidation over 24 hours by an average of 16% or 0.02 grams per milligrams of catechins. In a related review, researchers concluded that subjects consuming green tea and caffeine lost an average of 2.9 pounds within 12 weeks, while adhering to their regular diet. Beverages now account for 20% of total calories in the typical American diet. “As tea is calorie-free, it’s an ideal choice to help consumers meet fluid requirements without adding calories to their diet, and the modest increase in energy expenditure and fat oxidation can also add to the role of tea as part of a healthy, calorie-controlled diet that promotes weight loss or maintenance,” explained researcher Rick Hursel, of Maastricht University, The Netherlands. Osteoporosis is a major public health concern for many older women and men as the disease is responsible for two million fractures a year and 300,000 hip fractures in 2005. The disease leads to loss of mobility, independence and reduces quality of life for many older Americans. Researchers at Texas Tech University Health Sciences Center conducted studies with 150 postmenopausal women with low bone mass to see if the addition of green tea flavanols, Tai Chi exercise or both green tea plus Tai Chi could help improve markers for bone health and muscle strength in study participants. At the end of the six-month clinical trial they found that 500 milligrams of green tea extract (equivalent to four to six cups of green tea daily), alone or in combination with Tai Chi, improved markers for bone formation, reduced markers of inflammation and increased muscle strength in study participants. “The results of our study are consistent with earlier work suggesting that green tea flavanols exert bone health benefits by reducing inflammation and providing antioxidant protection. Our work suggests that green tea and weight bearing exercise like Tai Chi may be an effective way to help improve muscular strength, reduce inflammation and improve bone biomarkers, which may help reduce the risk for osteoporosis and fractures among older Americans,” said Chwan-Li (Leslie) Shen, lead researcher, at Texas Tech University Health Sciences Center in Lubbock, Texas. Consuming black tea improved attention and self-reported alertness in a human study conducted by Unilever R&D, Vlaardingen, The Netherlands. In this placebo-controlled study, designed to measure attention, task performance and alertness, subjects drinking tea were more accurate on an attention task and also felt more alert than subjects drinking a placebo. This work supports earlier studies on the mental benefits of tea. In addition, two other studies provide a broader perspective on tea’s effects on psychological well-being, showing benefits for tiredness and self-reported work performance, as well as mood and creative problem solving. These studies provide support for tea’s benefits for mental sharpness, as measured by attention, mood and performance. The leaves of the Camellia sinensis (tea) plant contain thousands of bioactive compounds that have been identified, quantified and studied for their mechanisms of action. While many of these compounds act as antioxidant flavonoids, not all of tea’s benefits are thought to be solely from antioxidant activity. New research presented by Alan Crozier of the University of Glasgow, UK, revealed that while many tea flavonoids in green and black tea are digested and absorbed, others are more resistant to digestion and travel mostly intact to the lower gastrointestinal tract, where they provide a probiotic effect by enabling beneficial bacteria to thrive. Flavonoids in tea, among other compounds present in tea leaves, may help ward off inflammation and vascular damage linked to chronic conditions associated with aging. 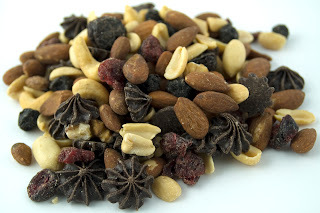 Wednesday’s Daily Dose of Dairy featured a unique cheddar cheese that contained an abundance of large flakes of rich dark chocolate. If you missed it, you can read about it HERE. 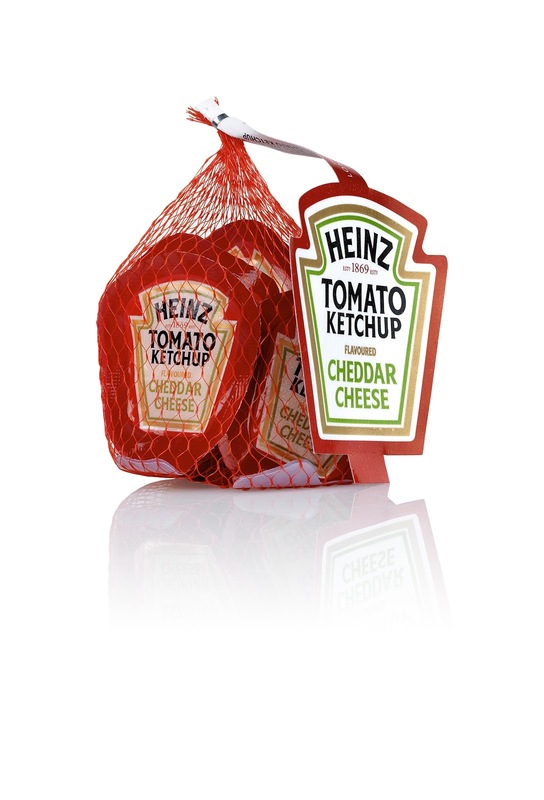 This product sparked some interesting dialogue with a number of subscribers, all of them asking how it is possible to get chocolate flakes in cheddar cheese. Honestly, I don’t know the answer, but it does confirm that anything is possible. Of course, it’s one thing to write or talk about innovative inclusion ideas. 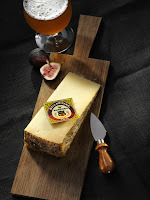 It’s another to actually see inclusions in action, such as the cheddar with chocolate. Here are nine other new dairy foods that feature innovative inclusions. Private-label retailer Trader Joe’s now offers an ice cream novelty that thinks it’s cheesecake. The product combines blueberry variegate with cheesecake-flavored ice cream. 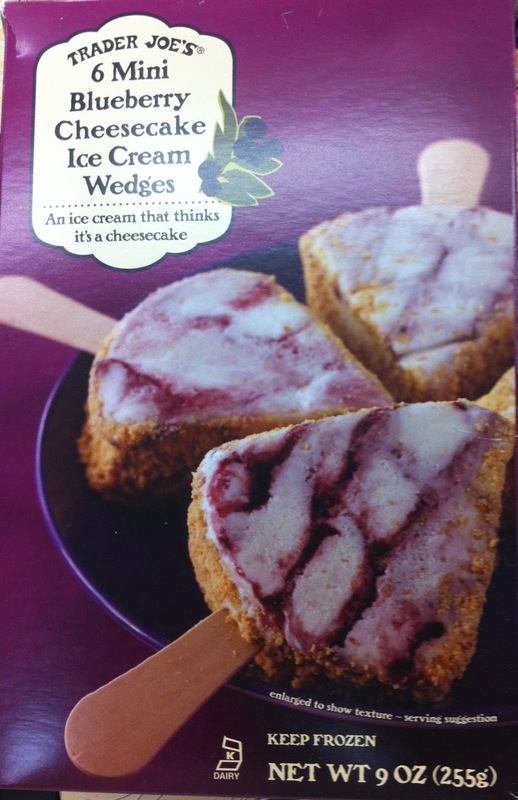 What looks like a wedge of pie comes on a stick, with the sides resembling a graham cracker crust. The company is on a role. (And by the way, that cheddar chocolate is from Aldi, Trader Joe’s parent company.) Trader Joe’s also shows us a new way to consume the superfood kale. 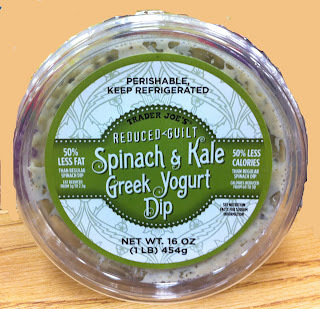 With Greek yogurt as a base, the company gives some zing to traditional spinach dip by including kale. The product is described as containing 50% less fat and calories than traditional spinach dip, which is usually made with a combination of sour cream and mayonnaise. 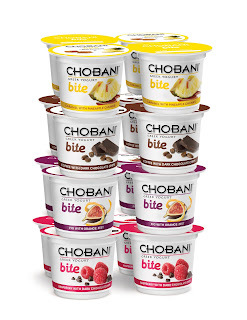 New Chobani Bite is an indulgent yet guilt free snack. These convenient, 3.5-ounce cups of blended Greek nonfat and low-fat yogurt come in four crave-worthy flavors: Fig with Orange Zest, Caramel with Pineapple, Coffee with Dark Chocolate Chips and Raspberry with Dark Chocolate Chips. 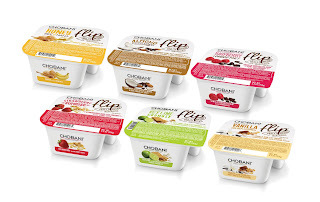 There’s also new Chobani Flip, where the consumer just flips the lid to add bold, delicious inclusions to Greek yogurt. 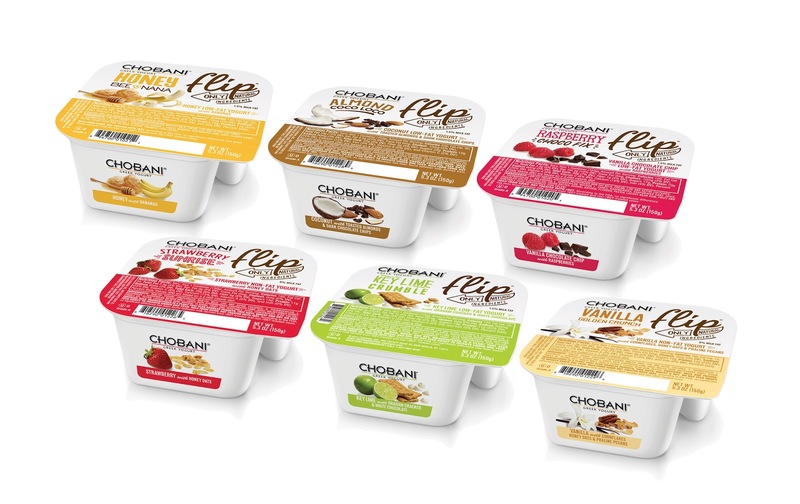 These easy-to-grab, 5.3-ounce cups are available in six flavor pairings: Vanilla Golden Crunch (vanilla nonfat yogurt with cornflakes, honey oats and pecans), Key Lime Crumble (key lime low-fat yogurt with graham crumble and white chocolate), Strawberry Sunrise (strawberry nonfat yogurt with honey oats), Honey Beenana (honey low-fat yogurt with banana), Almond Coco Loco (coconut low-fat yogurt with dark chocolate and sliced toasted almonds) and Raspberry Choco Fix (vanilla chocolate chip low-fat yogurt with raspberries). For more information, visit HERE. 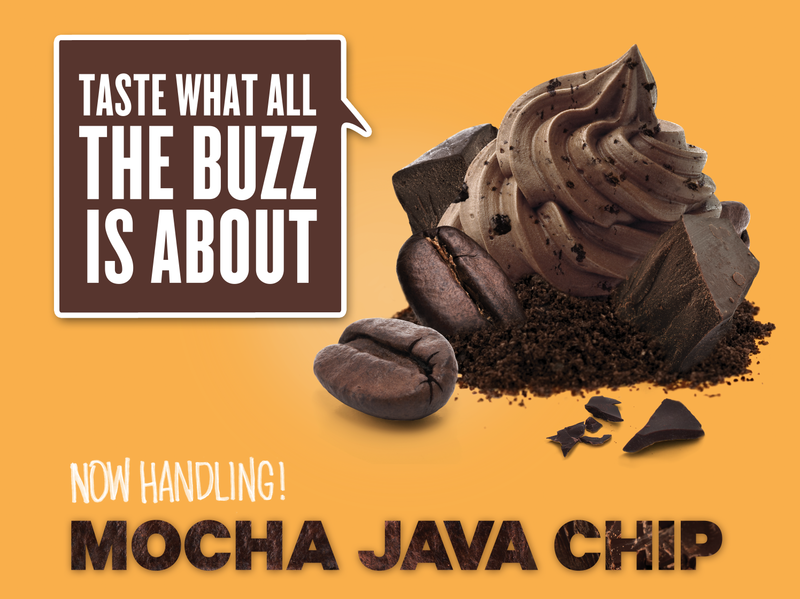 16 Handles is an innovative frozen yogurt and dessert brand that encourages guests to “Flaunt Their Flavor.” The 30-unit chain with stores in New York, New Jersey, Connecticut, Massachusetts, Maryland and Florida, recently introduced Mocha Java Chip. This proprietary new addition pairs a delicious dark chocolate taste with fresh, micro-ground coffee beans for an authentically refreshing pick me up. 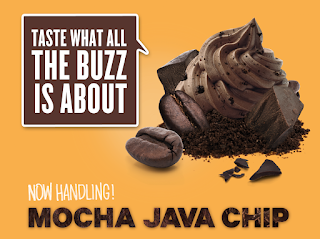 The flavor is available as a frozen yogurt treat and is also being featured in 16 Handles’ new Hot Chocolate Affogato, a frozen hot chocolate beverage that pairs premium Fro-Yo with Ghirardelli hot chocolate. For more information, visit HERE. From AbroadLong Clawson Dairy, a large U.K. cheese producer, has spiced up its cheddar offerings with three new flavors: Heinz Tomato Ketchup, Lea & Perrins Worcestershire Sauce and Tabasco Original Pepper Sauce. The cheeses also come in a variety of packages—snacking portions, slices, deli blocks, and wedges--to meet different use occasions. For more information, visit HERE. 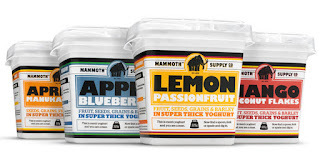 New Zealand’s Mammoth Supply Co., a business of Fonterra Brands, recently introduced Mammoth brand yogurts. The products are designed with a man’s appetite in mind. 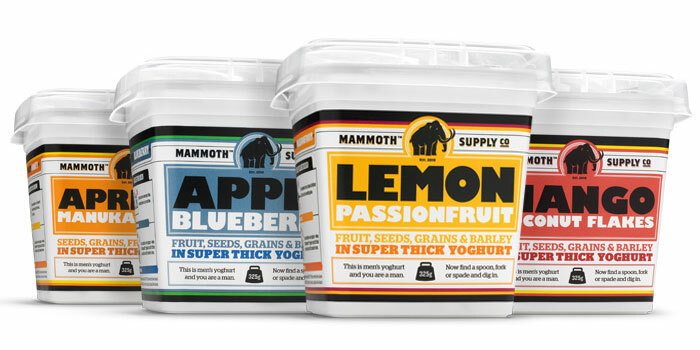 It’s not so much the characterizing fruits that make these yogurts unique, it’s the 5% to 6.5% (varies by flavor) inclusion of a seeds and grains blend comprised of: buckwheat, chia seeds, linseed, quinoa, pumpkin seeds and sunflower seeds. Some varieties also contain 0.5% pearl barley. Yogurt flavors are: Apple & Blueberry, Apple Pie with Cinnamon, Apricot & Manuka Honey, Berry Black Forest and Lemon & Passionfruit. 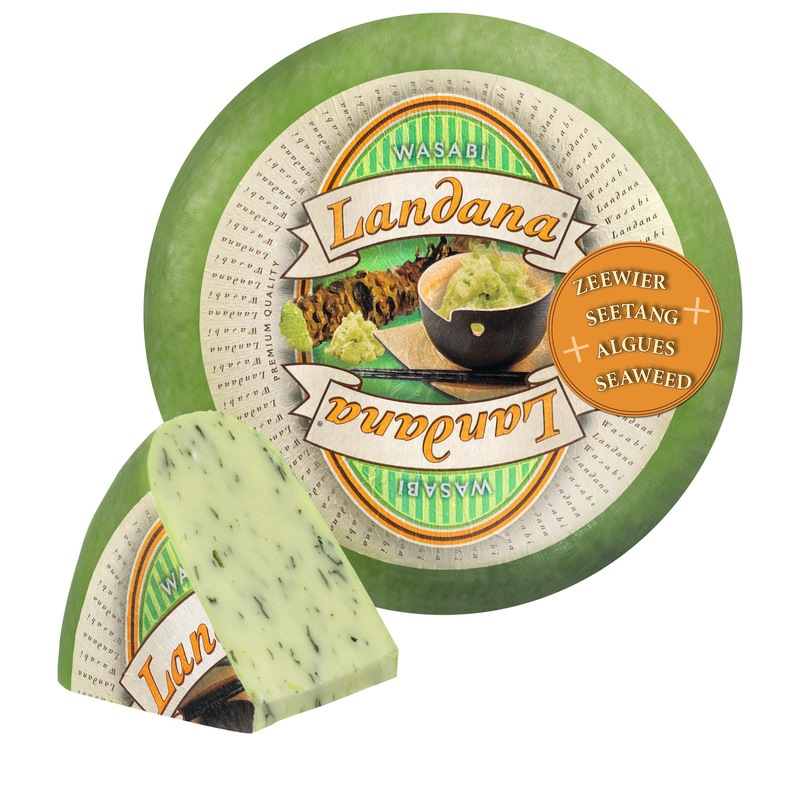 Dutch cheese specialist Vandersterre Groep International B.V., now makes Landana Wasabi. This product combines mild Landana cheese with spicy wasabi and lightly sweet fine bits of seaweed. Get InnovativeLooking for some creative ideas for your next big ice cream hit? Plan to attend IDFA’s popular Ice Cream Technology Conference, March 12 to 13 in St. Petersburg, Fla.
IDFA has added several new sessions to this year’s meeting, including the two-part “Chocolate Academy” and the “Mystery Basket” challenge. In the two-part Chocolate Academy, attendees will learn the fundamentals of chocolate and chocolate compounds with a focus on formulation and applications that inspire best practices and troubleshooting for ice cream and novelties. These sessions include a tasting of top food trends as they come to life in ice cream. The Ice Cream Flavor Mystery Basket session will borrow a concept from the popular Food Network cooking show “Chopped.” Attendees will work in teams using the mystery baskets’ secret ingredients that represent the latest culinary trends identified by three flavor supplier creators. “The ice cream technologists who attend this conference are some of the most creative, innovative people in the food industry, so we work hard to keep the conference program fresh and cutting edge,” says Cary Frye, IDFA vice president of regulatory and scientific affairs and host of the Ice Cream Technology Conference. We know milk is a critical component of the lunches served to school children. 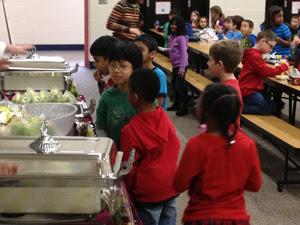 But other dairy foods play an important role in the meals and lessons taking place in our nation’s schools. Here are five programs to read about. In case you need to be brought up to speed, click HERE. USDA is asking the Greek yogurt industry to come up with a strategy for providing the high-protein yogurt in bulk through the federal school breakfast and lunch programs. Ready Pac, Irwindale, CA, hosted “Salad Day” at Osage Elementary School in Voorhees County New Jersey on Jan. 23, 2013. The event helped raise awareness of New Jersey’s innovative strides to combat childhood obesity, starting with healthy school meals. 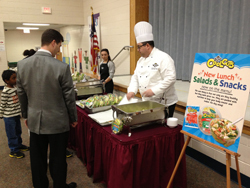 Students from grades one through five were invited to sample Ready Pac Cool Cuts bowl salads, which are among multiple healthy school lunch choices available to students. Ready Pac Cool Cuts salads and mini-meals are designed for elementary and middle school children. The line features five salad items and four mini-meals that include fresh produce and tasty proteins. Some of them include dairy in the form of cheese and yogurt. New Jersey school foodservice directors have been hard at work to implement the strict federal guidelines for school meals. Their programs, as part of the National School Lunch program, have key requirements including portion sizes that may be challenging to meet. Ready Pac’s fresh meals and snacks for schools help foodservice directors meet the guidelines, are kid-friendly and provide variety. I was fortunate to spend my Thursday morning at The French Pastry School of Chicago learning how critical dairy products are to their programs. The school has maintained an exclusive relationship with Plugra butter for more than 10 years, making Plugra the only fat used in all recipes. The school teaches its students the benefits of formulating with butter, specifically premium European-style Plugra. When these pastry chefs enter the market, they continue to use Plugra, which has been very positive for the brand. Franco Pacini, director of operations, and I posed with a dress being created out of Plugra wrappers for the school’s upcoming “For the Love of Chocolate Scholarship Foundation Annual Gala.” The dress will be modeled at the event, along with other fashion creations created by the pastry chefs. If you are unfamiliar with Plugra, you can read more HERE. According to Co-Founder and Academic Dean Chef Sebastien Canonne, the school has been unsuccessful with sourcing aseptically packaged premium cream (35% milkfat), as this product is not produced in the States and cannot be imported because of customs barriers. Aseptic premium cream is a product that pastry chefs around the world desire, as it can be shipped in bulk and stored at ambient temperature with a lengthy shelflife, as compared to fresh product that requires refrigeration and expires quickly. Further, the ultra-high-temperature (UHT) processing that the cream undergoes in order to be aseptically packaged contributes cooked notes to the cream that happen to be highly desirable in pastry applications. Can anyone help? Please email me at donna@dailydoseofdairy.com. For more information on The French Pastry School, visit HERE. Safeway Inc.’s exclusive dairy brand, Lucerne, recently selected the nine student finalists competing for a $30,000 grand prize in the Eighth Annual Lucerne The Art of Dairy art contest. The finalists will now transfer their designs onto an unconventional canvas--a life-sized fiberglass cow. Contest details and the finalists can be viewed HERE. Beginning April 17, the public will vote for their favorite cow and crown a winning artist in the contest that joins nutrition with artistic talent and ingenuity. In addition, as part of the Teacher Incentive Program, all schools that sent in entries were entered into a second-chance drawing, and one lucky school will win $1,000 for its art department. The entries are being tabulated and the winning school will be announced mid-March. Since the inception of the Art of Dairy contest in 2005, Lucerne has contributed over $373,000 to schools, teachers and students. This year, over 6,400 entries were received from schools across the country.